Gov. 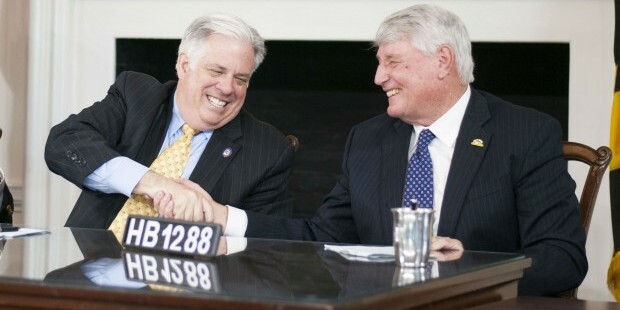 Larry Hogan and House Speaker Michael Busch after signing 350 bills Tuesday. Gov. Larry Hogan joined with legislators on Tuesday morning to sign 350 bills into law, putting the final seal of approval on several bills MarylandReporter.com has followed throughout this legislative session. Bills signed by Hogan, Speaker of the House Michael Busch and Senate President Mike Miller include increasing the cap on tort claims against counties and the state, expanding the Maryland False Claims Act protecting whistleblowers and repealing “the rain tax,” the mandatory stormwater remediation fee. “I am proud to sign bills that demonstrate our administration’s commitment to Maryland businesses,” Hogan said. The Watershed Protection and Restoration Program, sponsored by Senate President Mike Miller, allows counties and municipalities to regulate their own stormwater fee instead of a state mandate. Miller’s bill replaced Hogan’s simpler repeal measure, a key part of his legislative package. “Charging Marylanders for the rain that falls on the roof of their homes made the rain tax the most universally detested tax throughout the state and I am pleased to finally declare an end to it,” said Gov. Hogan in a press release following the signing. The bill does not actually take the county taxes off the books. Counties will now have to decide individually by what means they will meet their federal stormwater requirements, whether it be by retaining the tax or by implementing a fee. Hogan had the pleasure of signing another of his own priorities into law, the Fair Campaign Financing Fund, which creates a new “check off box” on income tax return forms. The box will allow everyday citizens to easily participate in campaign funding, giving them the option to donate up to $500 to the public campaign fund. “As Maryland’s first governor to be elected using public financing, Governor Hogan is a leading example of how public financing of elections can work to lift up the voices of everyday people in the political process,” said Nick Nyhart, president and CEO of Every Voice Center, a campaign finance watchdog group. The donated sum will be deducted by the comptroller’s office from the individual’s tax-return. People can now collect double the amount they were previously allowed to collect in tort claims against their local governments. The Tort Claims Act increases the lawsuit “cap” from $200,000 to $400,000 per individual claim and up to $800,000 per total claims in the same occurrence. Legislators in support of the bill throughout session say inflation over the years has caused the original $200,000 cap, decided back in the 1987, to only equate to $90,000 now. People will also have more time to file a claim after the incidents, increasing the previous time limit of 180 days to one year. Whistleblowers will be enticed to report fraud in companies doing work for state and local governments through the new Maryland False Claims act, rewarding them with a portion of the reclaimed funds as reward for their honesty, while also providing protection from on-the-job retaliation. Twenty-eight states have similar versions of Maryland’s’ new false claims act, Smith feels confident the state has a strong model to follow as the Attorney General’s Office moves forward. in response to persistent complaints and horror stories of government agencies failing to comply with Public Information Act requests and overcharging for the requested documents or files, legislators created a compliance board to more efficiently handle public record requests. Beginning in October, the State Public Information Act Compliance board will make getting public records from state and local governments in Maryland easier, more uniform and less expensive. The board will also establish a uniform fee for services, whereas before fees have reportedly ranged from $12.75 per hour to $50 per hour. The Overdose Response Program will aid in reducing heroin overdose fatalities by training every day people how to properly administer an emergency drug. During the bill hearing earlier this session, Dr. Leana Wen, Baltimore’s health commissioner, demonstrated the easy, three-step process of administering Naloxone on the committee room floor. Now, advanced practice nurses, in addition to specified nurse practitioners and pharmacists, may conduct overdose prevention educational training programs and will also receive legal immunity from liability if something were to go wrong while administering the drug. To aid in people leaving prison transition back into society, the Pilot Program for Small Business Development by Ex-Offenders will be established by Jan. 2016. Sen. Catherine Pugh created the legislation after an experience she had campaigning, coming in contact with an ex-felon who had created his own business. The pilot program selects a number of individuals from various jurisdictions to focus on, giving them funding and training to start their own small business.